Venus 2016 Conference – Save the date! The Venus Express spacecraft may finally have run out of fuel, but it leaves a rich scientific legacy: over eight years of Venus observations, and a renaissance of scientific attention to Venus. There is ample work still to be done on the immense dataset left from Venus Express, and as well as analysis of data from previous spacecraft and from ground-based telescopes; furthermore, there continue to be advances in computational modelling, laboratory simulations and in future mission preparation. 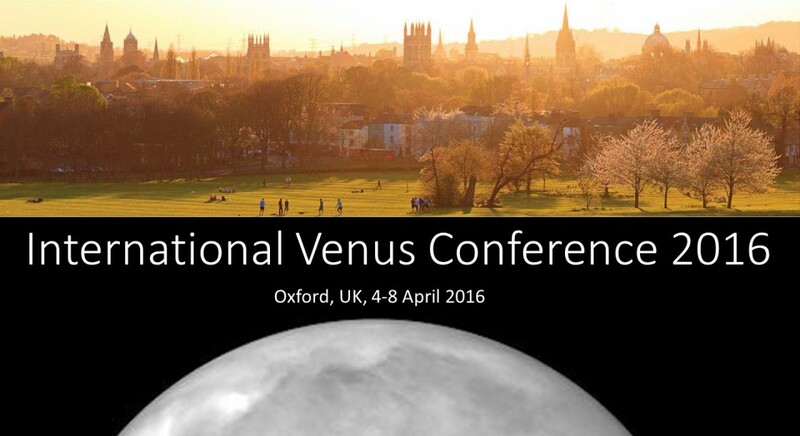 We therefore announce an International Venus Science Conference to be held in April 2016. The conference invites presentations on all aspects of Venus science, from the interior to the exosphere. Comparative planetology talks (highlighting parallels with other planets in our solar system or with exoplanets), and presentations related to future missions or investigations, are welcome. The programme will comprise invited and contributed talks, as well as posters. The abstract deadline is tentatively set for 8 Jan 2016. Following on from earlier conferences held in La Thuile (2007, 2008), Aussois (2010) and Catania (2013), the Venus 2016 meeting will be held in the centre of Oxford, UK. Conference participants will be able to stay in rooms in student rooms in Oxford University colleges or in nearby hotels – venue and accommodation details will be posted on this website. Thanks to our sponsors, the registration fee will be subsidised and financial support for early-career scientists will be available. An “indication of interest” link will shortly be added to the website to ensure that you are kept informed with future conference anouncements, but in the meantime please mark the conference dates on your calendar.